Before there was Military Police there was the Provost Guard. In this book Mr. Radley discusses the Confederate use of Provost Guards in a variety of roles familiar to MPs in the modern U.S. Army: prison guards, battlefield policing and security, POW processing, searching for deserters, etc. However, the Confederate experience also saw the use of PGs to root out spies and disloyalty among the civil populace, internal passport control and the security of transportation assets. Employing whatever units could be spared, the Provost Guard enforced unpopular edicts and were often seen by the military and civilians alike as nuisances. The effectiveness of the Provost went down as the fortunes of the Confederacy went down and reliable units were not available for use as Provost Guards. Kenneth Radley has obviously spent considerable time researching this topic. 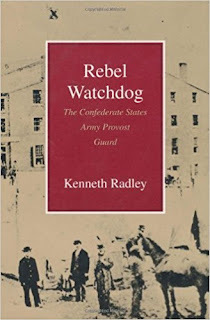 His use of first-person accounts and specific Confederate acts and regulations make this a vital book for understanding how the Confederate Army (and in fact the Confederacy itself) was policed.